In any case, this topic was at top of mind yesterday, since it poured all day long, and I was out on the Christiania with the girls. I took them to school, then rode to Alewife, then the CC office, then pickup and home - all in the most torrential rain. Those are good basics, and they keep me dry in most drizzly conditions. Yesterday I was wet round the neck and forearms because it was raining so hard. I brought my Tevas to change into but rode in LL Bean hunting boots, which are wonderful as long as I tuck my overtrousers over the tops to prevent them filling with water. My head was kept reasonably dry thanks to a Gore-tex helmet cover, and I wore a cycling cap underneath so that the bill would keep water out of my eyes. When it gets really cold, I stick to the same sort of arrangement with a couple crucial additions. I wear nice wool socks and my hiking boots, which keep my feet warm and dry. I wear balaclava and sometimes a scarf depending on how cold it is, and a nice wool cap. I also wear a long-sleeve wool jersey or mid-weight fleece under the Gore-tex jacket. On the bottom, I have Endura winter tights, and depending on the temperature, I often wear long wool tights over them. And if it's wet, I'll also do the overtrousers. Finally, I have some heavy Pearl Izumi gloves that I wear on their own or with lightweight wool liners. If you open up a high-end bike catalog these days, there are all sorts of Logan's Run-inspired outfits that can easily cost more than $500. In the winter, I'm not trying to set any speed records, so I'm usually happy with my layering approach. It only gets a little tricky when I strip off and have to find a place for all my stuff to dry. On this rainy rainy day, I took the girls to school in the Christiania, then parked at Alewife and took the T into town. I parked in the brand new "secure" bike parking cage. It's very nicely designed and spacious inside. I wasn't sure that I'd be able to fit through the door with my doublewide trike, but the door was more than wide enough. There was also nice spot at the back that was just right for me. But just how secure it is, I'm not really sure. Access can only be gained with a special Bike Charlie Card. Good, right? But it turns out that they'll give them out to anybody, and they don't keep track in any way. So after I got my card today, I could just as well have pillaged all the bikes in there instead of leaving my own. It does actually seem more secure, though. Maybe its the sense of enclosure, the video cameras and signs, or maybe it's just the newness of it all. One way or the other, I felt pretty good about leaving the trike in there, and I've never left it at Alewife before. I also left my drippy waterproof trousers there to dry. 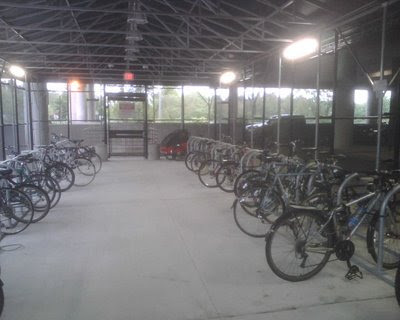 It was interesting to see that there were still far more bikes parked at the regular exposed racks than inside the enclosure, though maybe that will change as the word spreads. On October 1st, I join the team at Ciclismo Classico, a leader in adventure travel. I’m as excited as I could be about this opportunity. It will allow me to combine two of my great passions – cycling and travel – into my career, and who could ask for more than that? And on top of that, I’ll be working with two of my oldest friends (Lauren and Mauro), who I’ve known for almost 20 years. I met them way back in 1988 when I was looking for a place to live. When I spotted a flyer with drawings of bikes and Italian scenes about a room for rent in a Somerville house, I knew it was for me. That’s how I ended as house-mates with Lauren and Mauro, but my fascination with cycling and Italy really came to be a couple years before that. I was not very organized at all when I was in college. So it shouldn’t have come as a surprise when Thanksgiving arrived during my junior year and I still hadn’t applied for a program abroad for the spring semester. I was studying German, and I really wanted to go to Germany or Austria – but I missed the deadlines for every one of the programs. Fortunately, though, my college ran a program in Rome, and I made it in with days to spare. Of course, I didn’t know anything about Italy and spoke no Italian, but I wasn’t deterred – it was bound to be an improvement over Hartford! Despite my lack of knowledge going in, I had a perfectly wonderful time in Rome. Sure, I enjoyed my classes and my buddies and I had a nice time drinking wine in the Forum. But the best times were on my bike. While most of my classmates spent their time surrounded by other Americans and speaking English, a couple of us had brought our bikes along and ventured further afield. We headed out of town most weekends and had all manner of adventures. We eventually met someone who invited us to join his racing team, and we had lots of fun riding with him (though we never actually managed to compete in a race, somehow). The really wonderful thing was that it forced us to start speaking Italian and become comfortable in a foreign culture – something many of our classmates never managed to do. That was really the start of it all for me. And that’s why I begged Lauren to let me work with her and Mauro leading tours for Ciclismo Classico during the first year of the company. That summer was another great adventure. I drove the big red Fiat van (I did get to ride my bike a bit, though). Lauren, Mauro and I spent days before each tour planning and marking routes, then I would shuttle clients’ luggage from one destination to the next. Even from behind the wheel of the furgone rosso, I could recognize the power of the experience Ciclismo was providing, and I was sure that the company would ultimately succeed. A few years later, I was able to experience Ciclismo Classico from another vantage point: as a client. I was living in London, and a week on a bike in Italy was a perfect getaway for me (and an easy one, with flights many Italian destinations lasting only a couple hours!). By 1994, the company had been transformed: everything was much smoother and more professional than I’d remembered, and the trips I did (Elba and Sardegna) were completely blissful. I met delightful, interesting people that I’m still in touch with almost 15 years later, and my memories of those trips are still as clear as the waters surrounding L’Isola d’Elba. When the draw of family led us back to the US in 2006, Lauren was the first person I called for advice on where to live. We dropped in for a visit, and Lauren felt compelled to make her case for us moving to Arlington by putting me on a bike and riding a ways up the Minuteman Bikeway with me. That’s a trait that she and I most definitely have in common: when we’re passionate about something, we can’t keep it to ourselves – we have to share it. That’s part of what’s made Ciclismo Classico the success that it is, and that’s also why I’m so excited about this role: I can’t wait to share my passions with others and enable them to experience the personal transformation that cycle touring can create. A delightful ride yesterday! I rode with Team Ciclismo Classico. There were about a half dozen non-staff members of the team, all amiable as could be. One of the riders and I did the 50-mile loop, the others did the 30-miler. The day was gorgeous - low 60s in the morning to low 80s in the afternoon. Perfect! Nice and sunny, too. The route was beautiful for the most part. The first bit seems to be a major selling point: riding car-free on Storrow Drive. 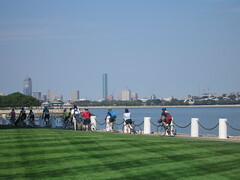 For me, that wasn't that big a deal at all - I mean, I ride on the Esplanade right there most days anyway, and Storrow's views aren't even as nice as that. More impressive were the parts of the route I don't normally experience, notably the bike path around the JFK Library, Arnold Arboretum, and Forest Hills Cemetary. The paths along the water really reminded me of the paths around London's Docklands - especially the haphazard way in which they pamper you one minute and dump you out into a brownfield warehouse disrict the next! The ride was generally well organized and executed, particularly considering the number of people who turned up. It was very well marked, with arrows all along the route (not just at turns), and the route splits clearly indicated as well. The marshalls at each major turn were also very good. The one notable problem was the food. The ride purports to be "fully supported" which, to me, means that you don't really need to bring anything along, including sustainance. Each stop had plenty of oranges and little food bars, but only the later stops had any bagels or bananas, which were just what I needed early on. The first rest stop had bags of dinner rolls, but nothing to put on them. If I hadn't brought my own snacks, I would have been in big trouble. A little energy drink would have been nice too, considering how hot it got to be. My final niggly comment is about the promotion of the ride. It isn't ever really clear who's organizing it, and who the proceeds benefit. Sure, that info is there if you look hard, but it's confusing that the city promotes it so heavily and yet the least you can get away spending if you want to ride is $45. If it's really a charity ride pure & simple, it ought to be billed as one - not as an event designed to get people out biking in Boston. I've been a little lax in posting for a while... I'm just now managing to catch up a bit. Here's the YouTube video of the D2R2 ride. I've had tons of views and lots of nice feedback on it! Again, what a wonderful ride! I mean, when can you do a ride with such variety - rocky climbs and descents, covered bridges, a bagpipe, and even a 50mph downhill!